Elite Chicago Limo will help you plan your event and will assure you will get the best value for the lowest rate. There are two ways of making a limo service Chicago reservation. Call us at 312-201-1055 to chat with our representatives and get and istant free quote. You can ask them about all the details of your trip. After you book a Chicago limousine, your representative will email your the reservation confirmation number. Now you will have a written contract with all the information you need. The alternative to the phone call is making reservations online. 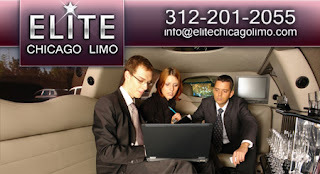 At elitechicago limo website, go to the reservation tab and click on the "Quock reservations". You will have to fill in the required fields for the dete, addresses, number of passengers and more. Be attentive when you enter your email address and credit card information. Our team of professionals will handle all the aspects of the event. We will oversee the details such as parking lots, the fastest ruote, complimentary bar items and more. It there is an unexpected delay, will always have a back up limo service Chicago vehicle that can take care of you. Our drivers always arrive 30 minutes prior the pick-up time. If needed, they will greet you with a sign at the airport or come to the door of your house. They will gladly help you with luggage and answer any questions regarding Chicago area. Your event will be trouble-free and flawles with our professional team.